Ran Levari is an accomplished AKBAN veteran and holds the prestigious Black belt degree from the AKBAN honbu dojo. 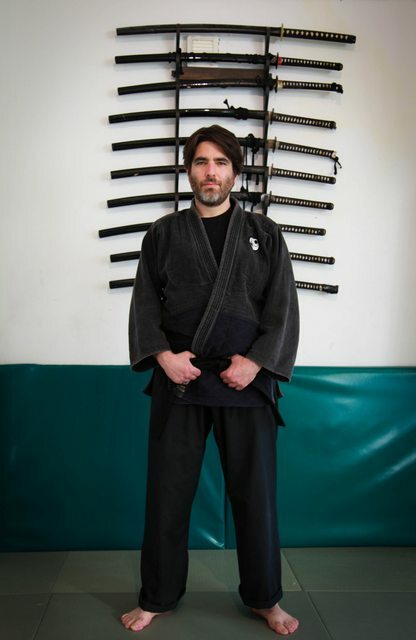 His direct teacher is Yossi Sheriff who encouraged him to establish the AKBAN dojo in Berlin. Ran studied the Bujinkan syllabus Ninjutsu in AKBAN for more then 12 years. During this time he has participated in countless seminars, colloquium and the grueling “24”. Before training in AKBAN Ran studied under notable teachers from the Bujinkan school of Ninjutsu for 10 years while always complementing his practice with general motion studies such as Yoga, Pilates, Feldenkrais and Niradin method. Ran is a musician. His craft is percussion and he specializes in composing, performing and teaching music theory and practice. In Berlin, Germany, Ran has started the AKBAN Germany Honbu dojo. As usual in AKBAN, all honest, humane and dedicated practitioners are most welcomed. The AKBAN Ninjutsu Berlin dojo accepts students after a personal interview.